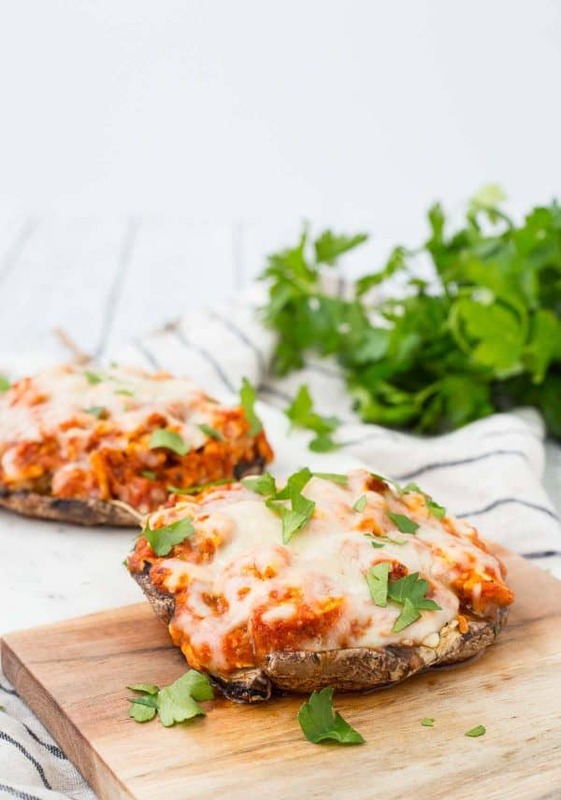 This Chicken Parmesan Stuffed Portobello Mushrooms recipe is a quick, healthy, and easy meal for busy weeknights. You could even use rotisserie chicken! Anyone else ready for spring? Every time I sit down to write this post, or edit these photos, or even think about these mushrooms, I think about the grilled portobella mushrooms with spinach you all love so much (that recipe has been pinned over 110,000 times!) and then I think of grilling, and then I think of spring and summer. I’m writing this the morning after a heavy snowfall and the drive in to the kids’ school was so beautiful (scary, but beautiful) this morning. The snow was glistening and clinging to tree branches. The fields that were once covered with corn stalks are now rolling white hills. We passed a herd of more than 30 deer walking through one snow covered field. It’s beautiful, there’s no denying it. I’m smitten with every season in our new country life, but I’m starting to get to the point where I’m ready to move on to spring. But in the meantime, I’ll take solace in quick and easy meals and try to enjoy the moment we’re in. Ben just said to me last night that it really struck him how fast our life was passing by. It’s so true. E is in Kindergarten, and Nathan is already 4. It’s insane and feels like they were just babies. So yes, let’s live in the moment and not always be thinking of what is next. 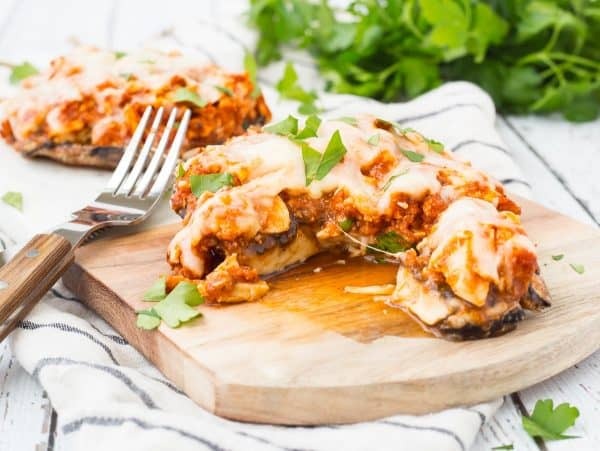 I’ll keep on making my quick and easy meals that give me plenty of time to play a game with E or wrestle in the living room with N.
This stuffed portobello mushrooms recipe uses one chicken breast — you could use rotisserie if you want or if you meal prep, cook some bone-in chicken breasts (or boneless) and keep them in the fridge for salads or recipes like this. I was actually testing another recipe that used two chicken breasts (for the life of me, I can’t remember what it is…I think I have early dementia), and my package of chicken contained three breasts. I threw the third in boiling water and poached it and threw it in the fridge. At the time, I didn’t know what I would do with it, but then I saw my portobello mushrooms and the lightbulb went on. If you want to make this a meal, I’d suggest serving with a salad (I recommend this kale salad with apples and raisins or an asparagus ribbon salad with beets and burrata) and/or a pile of vegetables. Roasted broccoli would be amazing with this and so would these roasted green beans with Parmesan. Some crusty bread dipped in olive oil is always a good choice too if you are craving some carbs. 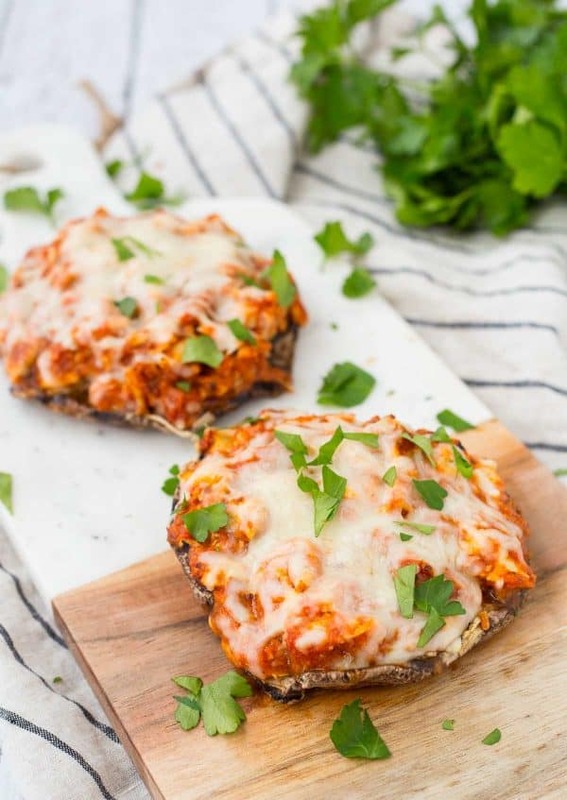 This Chicken Parmesan Stuffed Portobello Mushrooms recipe is a quick and easy meal for busy weeknights. You could even use rotisserie chicken! Scrape black gills out of mushrooms with a spoon and remove stem. 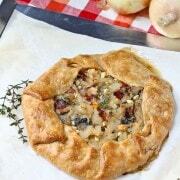 Place mushrooms on a parchment paper lined baking sheet, gill sides up. In a small bowl, combine chicken breast with sauce and parmesan cheese. Stir until well combined. Pile chicken mixture evenly on top of prepared mushrooms. Sprinkle with Mozzarella cheese. 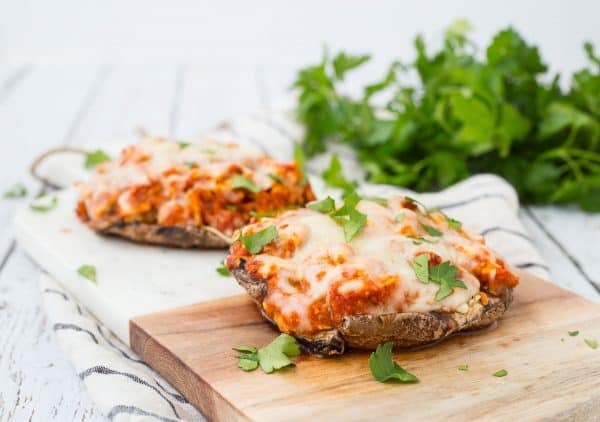 Bake mushrooms in the preheated oven until tender and cheese is melted, about 15-17 minutes. Verdict: I love this stuffed portobello mushrooms recipe. They are super filling and flavorful. 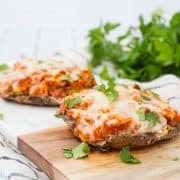 Definitely a healthy and satisfying way to get those Chicken Parmesan flavors! Husband’s take: He loves these mushrooms and he was surprised how filling they were too. Changes I would make: Well, I’ve been known to add spinach to everything and next time I make this, I’m adding spinach. Do you LOVE Chicken Parmesan? 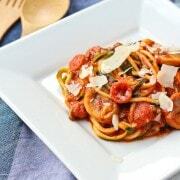 Try these other recipes: Baked Chicken Parmesan Sheet Pan Dinner with Broccoli, Chicken Parmesan Meatballs from Barefeet in the Kitchen, Chicken Parmesan Pasta Skillet from The Cookie Rookie, One Pot Lightened Up Chicken Parmesan Pasta from Foodie with Family, and Cheater Chicken Parmesan Bake from Taste and Tell. Can it be cooked and put into the fridge to eat the next day? Or is it only good when it’s freshly cooked? I think you could prep this a day ahead. Of course, as with most things, they’re better fresh, but I still think they’d be fine. They might get a little more liquidy, but I don’t see any other issues. Let me know if you try it! To the filling? Waste not, want not! You could chop the stem and add it, but if you add the gills, the filling will get too watery and dark colored, it won’t be very appetizing, unfortunately. You could save them and use them in a vegetable stock, maybe? We tried this recipe and didn’t notice the “cooked chicken” in the ingredients list so proceeded to put uncooked chicken in the mixing bowl. I suggest changing the directions and adding that in there somewhere! That’s definitely an important detail! I’ll try to clarify a bit. it doesn’t say in the recipe. Either will work! I hope you love these! I made this last night! Had leftover chopped up chicken and just added lots of parm & asiago to some tomato sauce (and some basil) and cooked it pretty much as instructed. really good! I don’t even care that much for portobellos but my husband loves them so this was a win :) Thanks! It’s such a great use for leftover chicken. I’m so glad you and your husband liked these! Thanks for taking the time to come back and leave a comment! This was delicious! Loved it. So glad you enjoyed this recipe! Thanks for taking the time to come back and leave a comment, it means a lot to me! This recipe will now become one of the staples that I will prepare for guests. It was really easy to make and my boyfriend loved it.! I’m so happy to hear that! Thanks for taking the time to come back and leave a comment, it means the world to me! The recipe does not clearly say but I assume the shredded or finely chopped chicken breast is already cooked? Or will it cook along with the other ingredients? I’m with you, I love the look and beauty of snow, but driving through it isn’t my favorite! I love that you stuffed so much goodness into these! This is a FABULOUS idea for such a healthy chicken dish! These look amazing! I LOVE mushrooms! 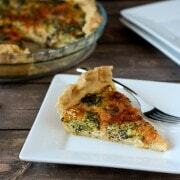 Such a flavorful recipe! Great pictures too. I can’t get over this! Love! Rachel–this is a GREAT idea!! Such a lighter way to enjoy comfort food.